Visit Nearpod’s partner, Breaking the Barrier, at booth #901. MIAMI (Nov. 15, 2018) – Nearpod, the award-winning K-12 instructional solution that increases student understanding and engagement, today announced its partnership with Breaking the Barrier to transform foreign language instruction. Together, the companies are creating Nearpod World Languages en español, a grade 6-12 supplemental Spanish curriculum that combines foundational skills and exposure to Spanish-speaking cultures. Both Nearpod and Breaking the Barrier will be attending ACTFL this year. Attendees of the 2018 ACTFL Annual Conference can stop by booth #1243 for in-person demos. More information on the curriculum is available here. As we prepare students for a global workforce, there is an increased need for language learning, as well as cultural competency. Additionally, the study of a world language is required by America’s most competitive colleges, which makes it critical to preparing students for higher education. However, approaches to learning languages through rote memorization are hardly a student favorite and can hinder learning by focusing on effort rather than practical mastery, according to research from MIT. 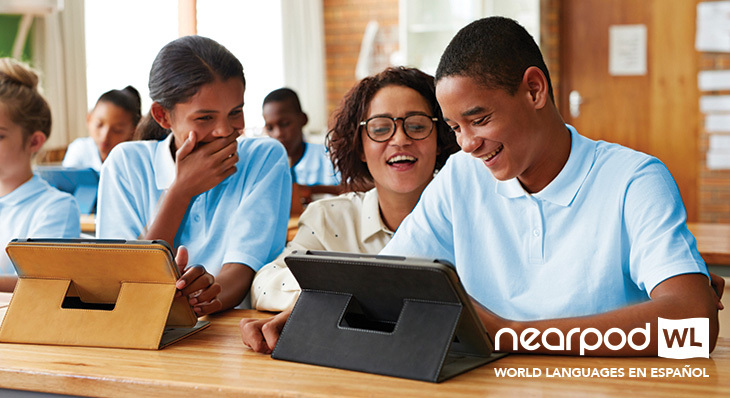 Nearpod’s World Languages en español shifts the focus away from dry memorization to the vibrant connections between language and culture. Standards-aligned lessons cover Spanish 1 through 3 and focus on Countries and Communities, Oral Language Production, Grammar and Vocabulary, and Reading and Writing. Built around AP Themes, and the ACTFL’s 5 Cs, World Languages en español lowers the affective filter and increases oral language production through dynamic, authentic multimedia and Virtual Reality experiences. Lessons also offer real-world contexts, giving students a compelling opportunity to speak and converse. Nearpod is an award-winning education technology company that is empowering teachers to transform instruction and is used in over 60 percent of school districts across the US. The company is changing how teachers are integrating technology into the classroom through a combination of software that merges multimedia with real-time student feedback, ready to run digital content designed in partnership with respected publishers like Common Sense Education, PhET and Readworks, and unparalleled educator support. Founded by educators, Breaking the Barrier has been providing award-winning print and digital materials for language learning since 1997. Blending the rigor of serious content with simplicity, clarity and a student-friendly voice, Breaking the Barrier leads students down a path to fluency while building their confidence to read, write and speak proficiently. Up to date cultural content brings the language to life and inspires students as the company works toward its mission to help the world communicate – better – by offering the best materials available for mastering a new language.